Recently I noticed that if I go to Control Panel > Hardware and Sound > Devices and Printers, my laptop is displayed with an error icon beside it, and hovering over it gives "Status: Driver is unavailable, driver error". Troubleshooting does not find any problems. I visited the hardware update page for my model but everything should be up to date, the only thing I'm not certain of is my BIOS. I downloaded the most recent update from July 2016 but was told my "device blocked the update" (which should mean it's up to date, but can't confirm) and using MSinfo32.exe won't work to check my current BIOS version, saying it can't access the WMI software. Within this week I've encountered 2 blue screens. First was DRIVER_IRQL_NOT_LESS_OR_EQUAL and today was SYSTEM_SERVICE_EXCEPTION. I've recently updated my graphics drivers, I've AMD A8-6410 APU with AMD Radeon R5, if that is relevant. I have noticed that while I am gaming, my laptop will freeze up and make awful noises out of the audio before chilling out (it does not crash)—but I do notice my Internet will drop, then it will tell me no networks are available, and this is unfixable until after restarting my laptop. After some research I did boot into Safe Mood and go into Device Manager. I saw 3 things with errors, my System Firmware, the UPnP Monitor, and an Unknown Device. I wasn't clear if I did this properly, but I right clicked all three of these and uninstalled them, then restarted my system. Was there an extra step to that process before restarting? I tried to verify how to reinstall such things but couldn't find answers. My laptop is a few months out of its warranty. Thank you for showing your interest in HP Support Forums. It is a great place to find the help you need, from other users, HP experts, and other support personnel. For you to have the best experience on the HP forum, you could also visit our HP Forums Guide for First Time Here? Learn How to Post and More. Launch Device Manager (Press the Ctrl key + letter X simultaneously and from the drop down click on Device Manager). Now Right click on each device which has a Red X or a Yellow exclamation mark and delete them. Next thing, I would suggest is to launch our HP Support website and then install the updates for those devices. I performed the hard reset successfully and then launched the Device Manager. The only thing with an error was an "Unknown Device" under "Other devices". Any speculation as to what this could be? I always have a wireless mouse connected to my laptop via USB, but no other peripherals. I am not certain this fixed my problem, as I'd have to test it out through the night. However, going to Control Panel > Hardware and Sound > Devices and Printers no longer shows an error mark next to my laptop, but it still says "Driver unavailable". Is this normal? To update drivers, you at least need to identify the device name. But for the Unknown device, it is impossible to get their device name directly. In this case, it is hard or impossible to find the right driver. Fortunately, every device has its own hardware id. 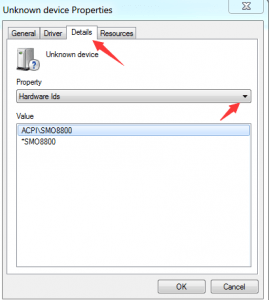 You can use their hardware id to identify unknown device then find the right driver. Following steps below to get the hardware id of the unknown device. 2. Right-click on the Unknown device and click Properties. 3. Click Details tab and click the drop down menu of Property. Select Hardware Ids from the drop down menu and the value field will populate with a list of values. Right-click on the top-most value and choose Copy from the menu. After that, paste the value into the search engine you like. Then you can also use your OS version and the keyword “driver” to search the driver. 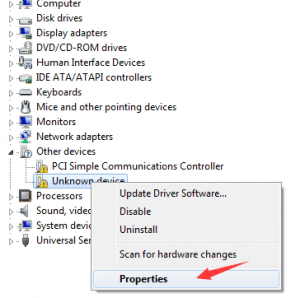 Please make sure you find the right driver, as wrong drivers can cause serious PC problems. The Unknown device had an ID of ACPI\ASD0001\2&DABA3FF&3. There weren't any updates for it around, though. I have, however, noticed something else: when my laptop will freeze up momentarily, and my Internet will drop afterwards, proceeding to tell me "no networks available" (although the Internet is up and running, perfectly accessible), I checked Device Manager and my Network Adapter (Realtek RTL8188EE 802.11 b/g/n Wi-Fi Adapter) had an error. Restarting my laptop fixes this issue but one time it actually didn't, no error was shown for the adapter, but disabling then enabling fixed it after restart. Before restarting though, nothing else works to solve it. This crash happens several times while using the laptop, typically while I'm gaming online, but it has happened when I was just browsing the Internet. I looked up drivers for this adapter earlier, and other similar issues, but didn't find a resolution myself. Thank you for all of your helpful info so far. Open CMD as Admin: Copy the following commands, and press enter each time. If the PC is freezing, I would suggest you run an extensive test on the hard drive from F2. I completed the command prompt steps. How do I know if the issue is resolved—which one in particular does it fix? I can't tell a difference overall. I had run these prompts 3 days ago and may have noticed that my Wi-Fi adapter crashed less often, but today it's been pretty bad. I repeated it again just a bit ago. I haven't had time to run an extensive test on the hard drive, but I did run the quick test. Everything passed, although the battery came up with "Primary — OK (1)", which I'm not sure what that means. Should I still follow through with the extensive test? EDIT: Checking Control Panel > Hardware and Sound > Devices and Printers, again it says the driver needs troubleshooting, driver unavailable. Troubleshooting cannot identify the problem. Thanks for the update, I appreciate the time taken to troubleshoot. As I understand you have tried the steps suggested and still having the same issue. I would suggest you perform a system recovery using the partition available on your PC. Doing this will wipe off everything from the computer. So, please backup all your important data. If this option fails which means either the partition is corrupted or system file is missing.